Ever wondered how they get that pumping sound on a lead? When it's almost sucking the audio in, generally on the off-beat.. An example of this can be heard on Guetta's 'Titanium'.. Now there's some serious side-chaining going on there! Once you're set up, try this on high hats and other percussion.. For many instruments side chain compression can create great movement in the music, you can of course have different elements sending to Aux bus's creating all sorts of rhythms, just using the input as a trigger into the compressor but not hearing that instrument. Below is an easy step by step guide to using side chain compression in Logic Pro Audio with the included compressor plug in. 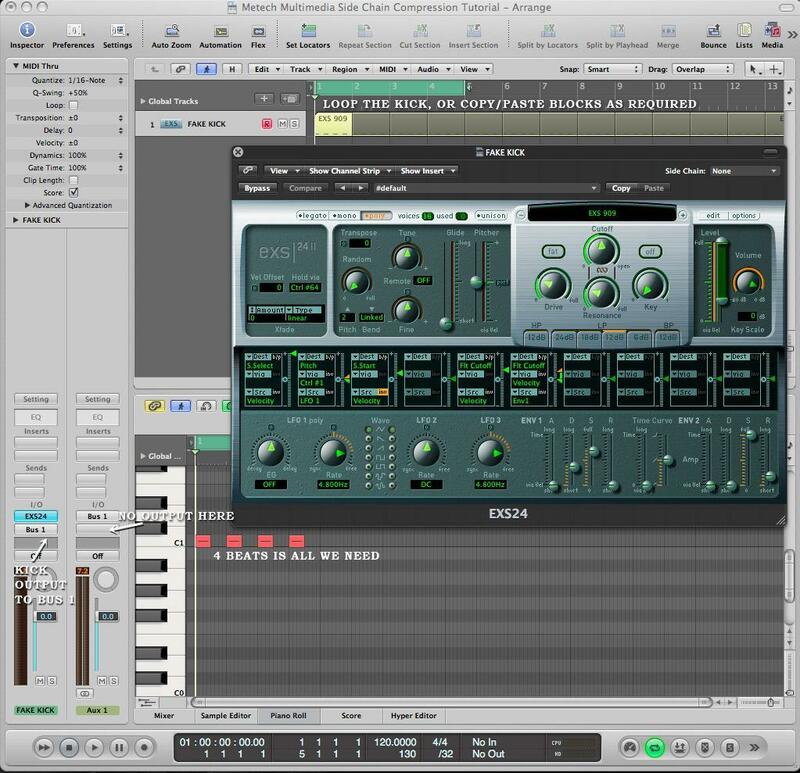 This example is simplified in both content and knowledge required to help those who are new to Logic Pro Audio but also be of interest to producers and writers developing their production skills. We need two elements - a kick drum we don't hear and the synth we are going to effect with the compressor. Why not use your existing kick drum? - With the fake one (no outputs) it's there all the time, in drops, during bar-end fills. If you play your lead sound when there is no trigger going to the compressor (ie your kick's not playing), you will notice a sharp rise in volume, not ideal.. 1.) On a new channel create a software instrument and load an EX24 Sampler, then find the EXS 909 kick. The output of the channel needs to be sent to a bus, so hold down your mouse on the output section and select Bus 1. An Auxiliary channel is automatically created with Bus 1 as the input. I normally rename this Aux channel to 'Kick Sender'. 2.) 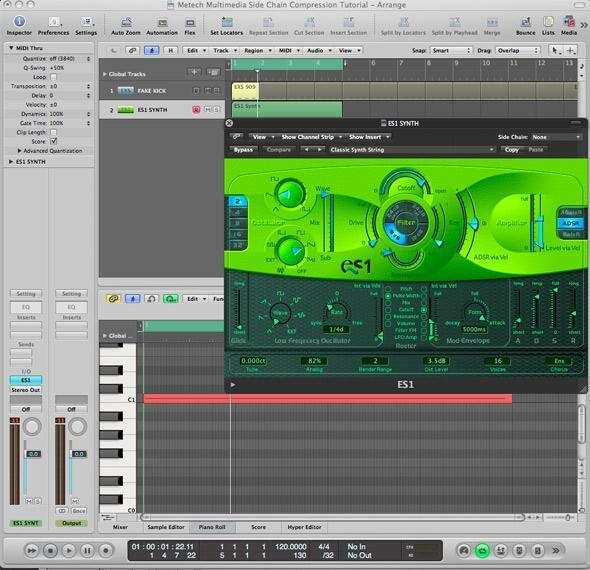 On a new channel select the ES1 Synth and choose Synth Strings/Classic Synth String. This will give you a constant sound, so it will be very obvious what the compressor is doing to the sound. Starting at bar 1, record a continuous note for 16 beats. This should cover 4 bars, so ideally make your note last 3 3 3 118 and bang the value (volume) up to 126. Back in the arrange window loop the 4 bars. 3.) On the ES1 Channel insert a Compressor. Circuit Type should be either VCA or FET for the best result. Pull your Attack down to 0. Bring the Ratio up to about 3.7:1. Side Chain select Bus 1. Press play on your transport. Go back to the compressor and move the threshold down. This will influence how much of the front of the note you will hear. You play this off with the ratio until your are happy you are hearing what you want to hear. The Release will be influenced by the tempo of your song. In this example I'm set to 120bpm and with the release at about 270ms that's creating a slightly lazy feel which is more rhythmical. The compressor threshold is at -50, grabbing all the sound. There's loads of ways you can feed sounds and loops into a side chain.. 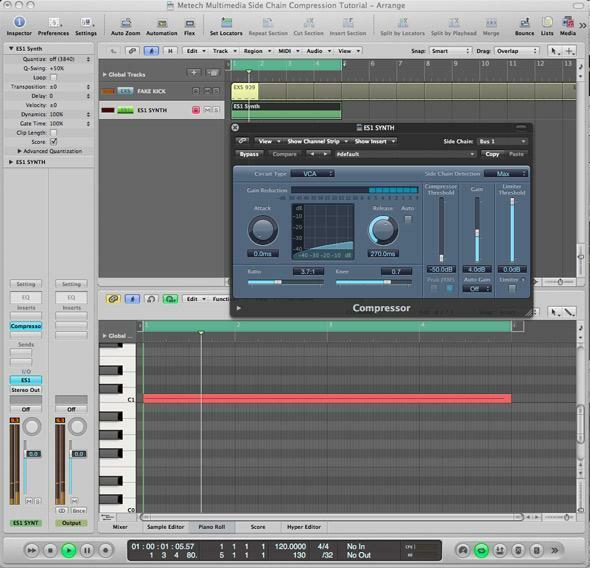 Audio tracks are simply selected in the side chain input of the compressor. You can hear the sound you're triggering with (or not) on the audio track by selecting outputs on or off.. Updated later, I'm off for some kip..